Jack Carney (left) receiving his certificate. 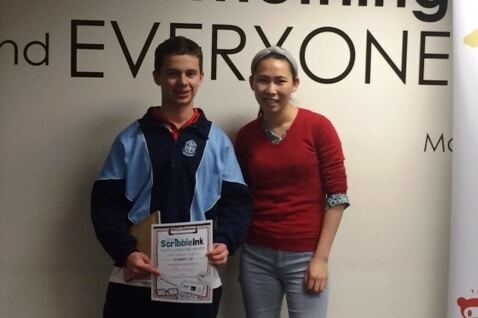 Jack Carney, a St Mary’s Cathedral College student with a passion for writing, was awarded a runner-up prize at the Georges River Council SribbleInk Youth Literature Awards for excellence in writing last week. Now in Year 9, Jack has had an interest in creative writing from a very young age, and several years ago began entering writing competitions. In 2015 he entered the Write 4 Fun short story competition where his short story was chosen as a finalist out of 11,500 entries. Jack received a highly commended award for his essay titled “The Need to Read” in the Whitlam Institute’s What Matters? Competition, which also earned him a letter of congratulations from Dr Dan White, executive director of Sydney Catholic Schools. Jack said he is inspired by favourite authors, including George Orwell, William Golding, Alan Moore, and Chris Morphew, and admits he still has a soft spot for his favourite childhood author – Andy Griffiths. A keen debater, Jack has been a member of the college debating and public speaking team since he was in Year 7. Most recently, he participated in the UN Youth Voice Public Speaking Competition at the University of Sydney, where he spoke on decreasing the education gap between Australian schools. In his spare time, he is an avid reader, and loves working on his comic book series, Lanton Detectives, which he shares with family and friends. Jack is working on his first novel, which he hopes to one day have published.